Here are convenient answers to many of the most popular questions about the Perfect Patients website service. If you have a question that’s not answered here, contact us today. How does the Perfect Patients website service produce new chiropractic patients? We use proprietary search-engine-optimization strategies so your site ranks high with all major search engines and new patient-producing websites.We interview you and our writing team creates persuasive content about you and your practice that induces website visitors to choose you. We proactively monitor the new patient performance of your site and make changes based on objective data about keyword performance, time on page, number of pages visited and number of pages shared on social media. Can I add, edit and delete content on my site? Yes. You can add, edit or delete pages using our simple-to-use Content Management System. And, you can add as many pages as you wish. Does Perfect Patients use the WordPress platform? We started with the WordPress platform and removed many of the superfluous features that didn’t contribute to producing new patients. Then our developers wrote 17 custom plug-ins to create the functionality we needed for state-of-the-art SEO, email broadcasts, language customization, new content previewing and other popular Perfect Patients features. Can I install WordPress plug-ins to my website? Not directly. However submit your plug-in request to our development team who can determine 1) if it will function on our system and 2) whether it includes proper security measures to avoid exposing you, other clients or our servers to malicious attacks. What if I already have a chiropractic website? Upgrading is easy! You keep your current domain address and we simply transfer it so it’s hosted on the Perfect Patients servers. We can harvest any of your content you wish to retain from your current site, which will fast track your site development. When you’re ready to go live, switching off your old site and replacing it with your new Perfect Patients website can take a day or two to propagate across the Internet. How much flexibility do I have with site design? While all Perfect Patients sites use the same underlying programming and interactivity, they all look quite different. Start by choosing one of the templated designs. Then tell us your color preferences. Your input and approval is integrated at every stage. The result is a unique, custom design that reflects your individuality. Is a Perfect Patients website HIPAA compliant? Yes. Patient communication and the emails generated by your website are seen as an extension of the care you deliver in your practice. Every piece of patient communication from your website has the provision to opt-out. No diagnosis is ever linked with a patient’s name or other personal information. The website subscriber database is password protected, encrypted and can only be accessed by you or those you specifically nominate. I'm prevented from using the term 'Doctor' or using patient testimonials in my jurisdiction. No problem. Your Perfect Patients site is configured to ensure that Statutory and Examination Board standards are fully satisfied. Just let us know how you want your site configured. How do patients become Subscribers of my website? When your site is launched, you’ll receive a patient enrollment form that you use to collect each patient’s name and email address. You, or someone you delegate, goes online to your Console and enters the data into your database and a welcome email is sent to each patient. This video explains how. During this one-time procedure you determine if the individual will receive the e-Learning modules or birthday greetings. If you already have an inventory of email addresses, we can perform a one-time bulk upload from your management software export. Can I post videos on my site? Sure. If you have an audio or video lecture or some other multimedia content (which you own the rights to), we’re happy to post it on your site. Some technical processing may be necessary to optimize it to “stream” online and based on its length there may be a nominal fee for this service. How many email accounts do I get? As many as you can actively use. Will my site have American English or British English? Can I promote a monthly special? 1) Use your email console to send your own custom email to your website subscribers. 2) Append a custom message as a postscript to the emails we send to your website subscribers on your behalf. 3) Add a banner ad to your site. Or all three! Your site provides a lot of flexibility so you can do as much or little additional practice promotion as you wish. Can I see the newsletters before they are sent to my patients? The editorial slant of every article is chosen by William Esteb of Patient Media Inc. who has been creating chiropractic patient communication materials for over three decades. What if I don't like one of the newsletter articles or blog posts? It’s rare, but it can happen. Typos or suggestions to enhance a newsletter article are eagerly accepted and rolled out to all of our customers. Or you can offer a suggestion on how to make the article acceptable and we’ll make the change to your instance of the newsletter. If a newsletter article is totally unacceptable, we can simply suppress sending that month’s newsletter to your patients. Blog posts, if necessary, can be individually edited for each client. Does my site show visitor statistics? Yes. Your Perfect Patients site includes a statistics package that is second to none. Besides the most obvious metrics, you can drill down to find out the source of your site visitors, the most popular pages on your site and how long they spend on your site. What happens at the end of the initial one-year service agreement? Our plan is to exceed your expectations and that you’ll want to renew! Like you, we want to create a long-term relationship with our clients. If you decide not to renew, we’ll transfer your domain to whomever you specify, thank you for the opportunity to be of service and part friends. What do I get for the monthly hosting fee? Refresh your homepage with new content giving visitors reasons to return again and again. Research, write and send on your behalf, your monthly Practice eNewsletter to your site subscribers. Email your newest subscribers with a short survey about their first visit experience. Monitor the new patient performance of your website, making updates as necessary to insure a return on your investment. Send a six-part eLearning curriculum to your new patients, educating them about the principles of chiropractic. Stand ready 24/7 to edit your website by adding new pictures, new staff, new hours or make any other changes at no charge. Constantly upgrade our software, adding new features, greater functionality and enhancing its ability to generate new patients. In other words, we “work” your site for you so your Internet presence pays its way by attracting new patients, stimulating referrals and increasing retention. Do I get a geographical exclusivity? Imagine that every chiropractor in your jurisdiction had a Perfect Patients website. It would actually make it easier for a prospective new patient to select the chiropractor that was the best fit. Instead of seeing new patients as scarce, our mission is to help new patients find a chiropractor who is convenient, has a patient-centered philosophy and practice style. 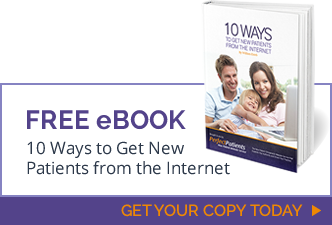 These are far more important in producing new patients than who manages your site! How long does it take before my site is live? This mostly depends upon how quickly we can conduct your content interview and receive your approval on our design recommendations. A general rule of thumb is between three and four weeks. Our prices are competitive, especially when you consider what you get. In other words, for about the price of a website product, you can get a website service. We provide pricing only in the context of explaining what our service includes. Which takes a mere 2-minutes by watching this video. What is the difference between the Essential, Premium, and Enterprise Plans? The Essential Plan balances new patient performance and patient education to boost retention and cultivate referrals. Choose our Essential Plan if you practice is in a medium-sized jurisdiction. Our Premium Plan is for practices serious about getting new patients through digital marketing. We maximize your website’s new patient pulling power by dominating search engines and expanding your online authority. Choose the Enterprise Plan if you have a multi-location practice needing a robust digital marketing strategy. Start by downloading a copy of our simple Service Agreement and put Perfect Patients to work for you and your practice today.